Everyone gets stressed from time to time but what happens when stress becomes a regular part of daily life? Stress can damage to the human body to any extent, from affecting our ability to cope and interact with the world around us to more physical symptoms such as hair loss. Stress can cause a hair loss condition known as Telogen Effluvium. Trigger for Telogen Effluvium can be anything from childbirth and pregnancy terminations to more severe emotional distress, often caused by personal traumas such as divorce, or an unexpected accident. At any one time, around 10% of hair is naturally in its resting phase, known as the telogen phase. When a person feels intense stress – whether emotional or physical, the body releases a large amount of adrenaline; this transmits a signal to the hair follicles which causes them to enter the telogen (resting) phase early, where they stay for three months. During this phase, there is no new hair growth. This results in an uneven hair growth. The final stage of the telogen phase, after around three months, is shedding to allow new hair to grow through. Consequently, around three months after the trigger incident, sudden and drastic hair loss can occur. This causes thinning hair all over the scalp. It is often a temporary condition where the hair growth returns to normal approximately six to twelve months after the event. However, in some cases, it can trigger Male Pattern Baldness or Female Pattern Hair Loss in those with the ‘balding gene’. 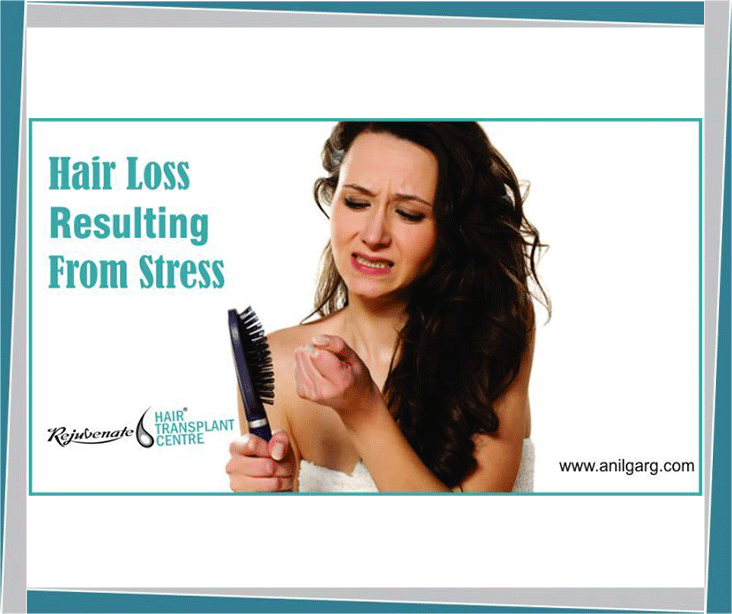 For those people already experiencing these forms of hereditary hair loss, stress can accelerate the rate of shedding. These permanent, genetic conditions may require treatment to prevent severe all-over hair thinning or baldness. Why are women more susceptible to Telogen Effluvium? As there are a wider possible series of triggers that affect women, it is not surprising that this condition affects females more than males. Several potential triggers of Telogen Effluvium are related to childbearing and can only be experienced by women. Far from being an unusual affliction, it’s estimated that around a fifth of new mothers experience some hair loss after giving birth, with some studies placing the figure as high as 45%.This is in sharp contrast to pregnancy, when many women notice their hair feels stronger and looks glossier, largely thanks to the influx of progesterone and oestrogen the body releases around this time. After birth, the body instantly drops these hormone levels, which can shock hair into its resting phase, causing Telogen Effluvium.The same is true of women who experience hair loss following a termination or while taking a contraceptive pill – the sudden change in hormone levels is a key trigger. There are several potential triggers which affect both sexes equally; these can include surgery, extreme grief or stress, or some medical treatments that can cause both female and male hair loss. Undergoing major surgery places a huge strain on an individual, both physically and emotionally. Although procedures which affect the scalp, such as micrografting follicles, have an increased chance of causing Telogen Effluvium, it can be caused by any type of major surgery which causes a shock to the body. There are also a number of drugs associated with surgery, mainly blood thinners and cholesterol-lowering drugs, which have hair loss as an associated symptom. Extreme stress, sudden shock or trauma are all thought to contribute to the onset of the autoimmune condition Alopecia Areata. This presents as rounded bald spots or patches anywhere on the scalp and, whilst in this mild to moderate form alopecia areata treatment can be successful in regrowing hair, there are versions of this condition – alopecia total is and alopecia universal is for which an effective treatment is yet to be found. As hair is considered to have a non-essential body function, the body will react to stress in a way that it considers being least harmful, hence the hair growth cycle can be affected. It is important to resolve the issue that is causing the stress or learn how to manage the stress so it has a lesser impact. Examples of how to deal with ‘small’ stresses include taking up a hobby you enjoy, exercise, meditation, spending time with friends and reading. It is important that this becomes a regular part of your routine to help the body relax and release tension. For stress that is more severe, such as divorce, workplace bullying, job loss or the death of a loved one, it is advisable to seek the help of a counsellor, support group or therapist. Once the underlying stress is being managed, it is possible to use hair loss treatments to help restore the hair growth cycle to its optimum condition. There are two hair loss products that have been proven to be effective and safe. Treatment courses featuring Minoxidil (suitable for men and women) can be tailored to suit each individual and when used alongside the correct combination of hair growth boosters, can restore normal, strong and healthy hair production. Where there is underlying genetic balding, or where stress-related hair loss has triggered male pattern baldness in men with an inherited predisposition, finasteride 1mg can also be taken. This once-a-day oral tablet is only suitable for men aged 18 and over. Whatever is causing the hair loss, trying to cope with it can add to the stress already being experienced. A specialist will be able to give you an accurate diagnosis, answer any questions you have and discuss treatment options.